By all accounts, 2017 included some substantial moves higher in the stock markets. These trends turned out to be true for most regions around the world, as it quickly became clear that the rising tide was truly lifting all boats. The S&P 500 is generally the most closely watched benchmark in the financial markets, and this is because it includes large-cap companies that tend to drive the rest of the global economy. There are real questions, however, with respect to whether or not these types of rallies higher can continue throughout the next year. When we look at the charts themselves, it is relatively clear that the impetus for many of these moves higher in equities has come as a result of the 2016 US Presidential election. Markets and investors have clearly been encouraged by the results as the pro-growth agenda stands to benefit many different market sectors if plans are passed and able to proceed further. 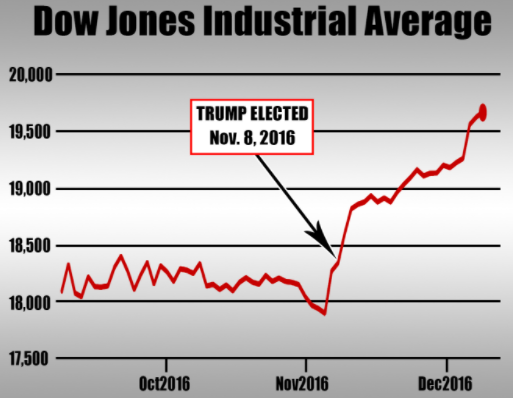 In the chart above, it is clear that the Dow Jones Industrial Average was still below 18,500. The Dow is a smaller collection of stocks that is more heavily focused on specific industries and sectors. Low interest rate levels, gold prices are changing and rising GDP data reports are all pointing in one direction, and the market has ignored recent political turmoil in North Korea as the Dow benchmark has since posted highs above the 25,000 mark. Given the strong psychological nature of this type of price level it is clear that the dominant direction is higher, and that most of the sideways activity that was seen during the earlier parts of 2016 found an impetus once the event risk of the election was out of the way. But given the fact that much of this buying has already occurred, the prospects for those holding mutual funds in 2018 are less likely to impress in the same fashion. At the Federal Reserve, the new Chairman (Jerome Powell) has a consistent record of voting policy that was largely in line with the direction taken by predecessor Janet Yellen. But this could ultimately prove to be another positive for stock markets as cheap cash rate help boost long term investment. As usual, the corporate earnings season will have the final say as business performance improvement statistics still suggest there could be areas of the market that miss analyst expectations. The first two quarters of the year will likely be the most important in terms of their ability to influence the long term trends that are seen within the broader economy. One of the biggest mistakes investors can make at this stage is to start chasing stock rallies at their currently elevated levels. If we start to see a slowdown in momentum, it could be very likely that late investors could actually end up under water if not positioned correctly. This article first appeared on Financials News.